In the Atlantic, Tropical Storm Joaquin is expected to slowly strengthen over the next two days. Joaquin's maximum sustained winds are near 40 mph. 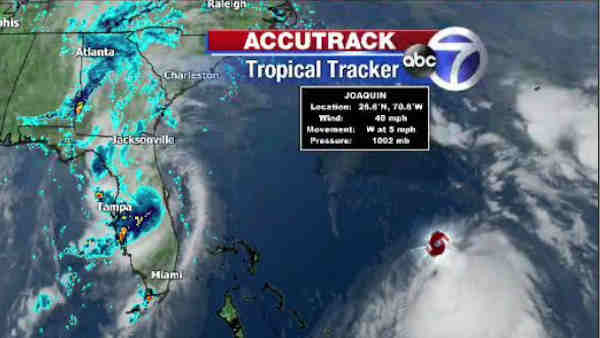 The storm is centered about 385 miles northeast of the central Bahamas and is moving west near 5 mph. Tropical Storm Marty has weakened a little off Mexico's Pacific coast. The storm's maximum sustained winds early Tuesday decreased to near 65 mph with additional weakening expected over the next few days. Marty is centered about 90 miles south of Zihuatanejo, Mexico, and is moving east near 2 mph. A tropical storm warning is in effect for part of Mexico's coast from Acapulco to Lazaro Cardenas.